Safe and slow is the way to go. 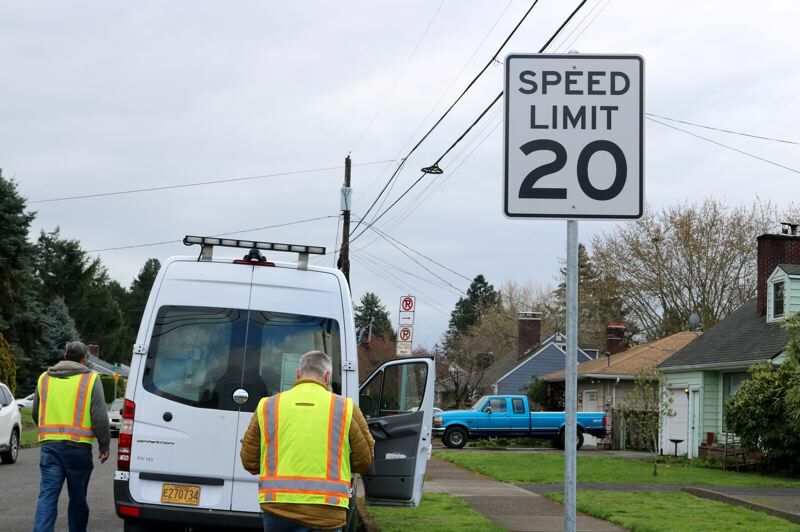 That's the message from the Portland Bureau of Transportation as it passed another milestone: Installation of the final marker in a series of 2,000 new 20 MPH speed limit signs now blanketing roughly 70 percent of city roadways. It's a finish line for the slow-down project approved by Portland City Hall in January, 2018 — and the beginning of a new legislative push to allow other municipalities to shift residential street speeds into lower gear. 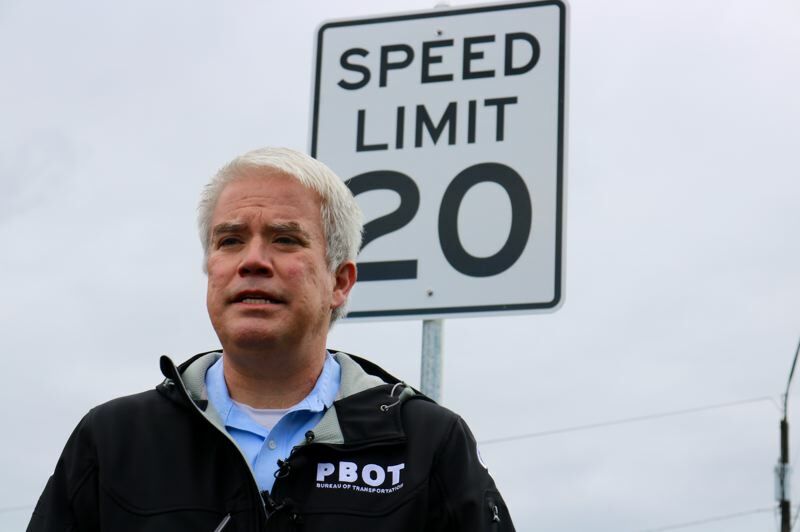 "Everyone knows this is not a state highway," said PBOT's Dylan Rivera, pointing to the new sign on Southeast Salmon Street near 122nd Avenue on Tuesday, April 9. "Yet historically, we've had to request state permission to adjust the speed limit on these city streets." A 2017 law sponsored by state Rep. Rob Nosse, D-Portland, gave solely the Rose City the power to bump residential speed limits down 5 mph without making a request to the Oregon Department of Transportation. In all other cases, local officials must make a formal plea to the Oregon Department of Transportation, whose managers and traffic engineers decide to grant or reject the request. Rivera said the city has a few requests currently before ODOT, which takes anywhere between several months to several years to issue a decision. A city proposal to lower the speed limit on West Burnside Road where it crosses the Wildwood Trail was denied, for instance, due to concerns regarding the number of lanes and volume of traffic. A bill being mulled by the state Senate this session would allow any city in Oregon to lower residential speed limits by 5 mph. Rep. Nosse has introduced a related bill that would allow Portland to set the speed limit on any street, not just those in leafy neighborhoods. "Roads were not designed for the density of people now living in east Portland — they are too wide and vehicles move too fast," said Multnomah County Commissioner Jessica Vega Pederson, in written testimony to lawmaker's joint transportation committee. "Residents have told us that high speeds on residential streets are a top barrier to walking," added Chris Warner, PBOT's interim director. Previously, Portland only had less than 1,000 speed limit signs posted in residential areas. PBOT also distributed about 7,000 orange "20 is plenty" yard signs.